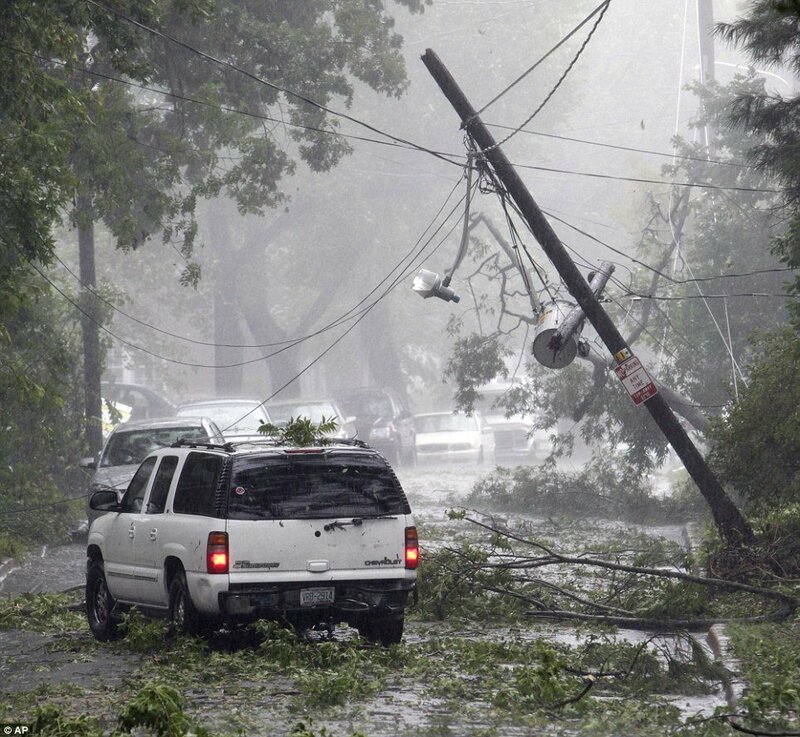 Home Breaking News Hurricane Irene: death toll more than 15 and 6 million power outages. Hurricane Irene’s remnants dissipate over Canada. At least 44 deaths in US. On Sunday, hurricane Irene passed over New York without major damage to the city, but the storm still caused deaths, serious floods and power blackouts affecting more than a million people as it swept up the US north-eastern seaboard. Hurricane Irene weakened quickly after making landfall near Atlantic City, New Jersey, at about 5:30 a.m., local time. Four hours later, it made landfall again at Coney Island. Meanwhile Irene had been downgraded by the National Hurricane Center to a tropical storm with winds at around 65mph – much weaker than the 85mph that was forecast late on Saturday. Irene’s biggest impact was felt on Sunday night in upstate New York and New England where many communities suffered devastating floods after rivers burst their banks and torrential rains fell on ground already saturated by unusually high downpours earlier this month. In the Catskills mountain town of Windham, where Irene dropped 10 inches of rain starting on Saturday night, the downtown area was “wiped out” by flood water. In nearby Prattsville, National Guard soldiers rescued 21 people who had been trapped in a motel by fast-moving water that blew out bridges and roads all over the county, according to Reuters. Vermont was also experiencing its worst flooding in almost 40 years, according to local reports. Many towns, including Brattleboro, Wilmington, Rutland and Grafton, were under water on Sunday night. “This is a storm that has claimed lives. Our thoughts and prayers are with those who have lost loved ones,” Barak Obama said. Irene killed 3 people as it passed over the north-eastern seaboard. In New Jersey a young woman was found dead in her car on a flooded rural road. The woman, 20 year-old, who has not yet been identified, had earlier called police after she and her car were washed away by a flash flood. “She left her house, went in her car and was swept away,” said New Jersey Governor Chris Christie. About 30 miles (48km) north-west of Manhattan, in New York’s Rockland County, a man was electrocuted by a downed power line after he tried to save a child who had gone out into a flooded street that had live wires, officials said. The child is now in hospital in a serious condition. In Prospect, Connecticut, another person was killed in a fire that investigators believe was sparked by fallen wires. Irene death toll now stands at more than 15 with lives lost all along the storm’s track from the Carolinas to Virginia and up through Pennsylvania, where a man was killed in his tent by a falling tree, to New York and beyond. A nuclear reactor in Maryland was shut down after it was damaged by wind. Others were taken offline or were operating at reduced capacity as precautionary measures. More than 6 million homes and businesses lost power as the storm passed up the east coast. 2 million people were warned or received evacuation orders. Flooding is likely to be the major problem this week. Parts of Philadelphia were heavily flooded, with water reaching street-sign levels in some areas. Flash flood warnings were issued up and down eastern and central Pennsylvania. New York’s public transport system is likely to be disrupted next week. On Sunday, transport workers waited for winds to die down before they were able to inspect train and subway lines. New York Governor Andrew Cuomo said it was too early to say when normal service would be resumed. The region’s major airports were closed on Sunday and were likely to be closed for at least part of Monday as airlines waited for transport systems to be restored so passengers could reach them. "catskill mountain railroad" "hurricane irene"